Have you ever wanted to learn to cook, but didn't know where to start? Or maybe you just want to invite a few friends over for an amazing dinner, but the cupboards are bare, and so is your confidence in the kitchen. If so, then Meghan Mehler can whip up just the recipe for a successful meal for you. Mehler is the owner of The Cooking School, a culinary education that comes to your kitchen. Or, if you just want to watch live "Food Network" in your home, she can do that, too. "The options are endless as to what we can do," said Mehler, who gives private lessons, group lessons, family gatherings, theme dinners, and team-building exercises around food. 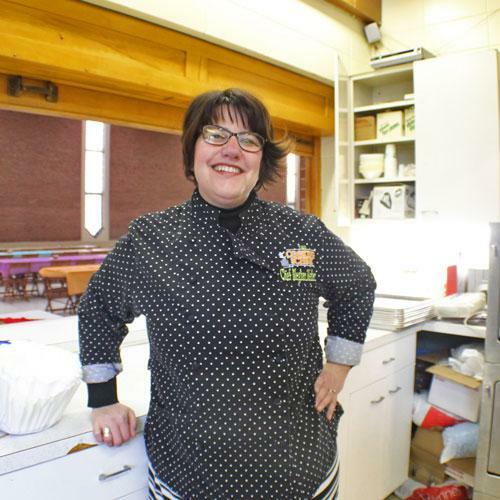 Mehler began The Cooking School in September, but has a long history in the culinary arts. She started in seventh grade serving and cleaning up after parties. By high school, she had her own catering business. She went to culinary school in Pittsburgh and transferred to Mercyhurst University, from which she graduated. She has worked at the Kahkwa Club, Aviation Club, and Hopper's Brew Pub (the latter two are now closed). She took the next 15 years off to focus on being a mother to Madeline and Jacob and wife to Jack Mehler. "I entertained constantly," she added. "That's where I get to use food as my outlet." Once Madeline and Jacob were independent, Mehler returned to Mercyhurst to teach. But she knew she had more to offer than university classes. She had partnered with her now-college-aged daughter in Venus Apothecaries and taught cooking classes at the now-defunct Frankie & May Fresh Grocer in Erie. Until the summer of 2016, Mehler's path was about as clear as trying to figure out dinner in the middle of Wegmans – so many choices, so little direction. Working with a like-minded group of entrepreneurial women, Mehler was able to pick and choose her ideas to develop a fully cooked plan. She wanted to mix her passion for teaching with her love of cooking. She wanted to do it where people are most comfortable – in their own kitchens. Since then, Mehler has brought The Cooking School to county government for lunch-and-learns, a bachelorette party, a birthday party, a travel group, and corporate team-building events. The classes can be as hands-on as the participants want. If you just want to watch Mehler's expertise, then you can sit, sip, and watch. If you pay attention, you might pick up a tip or two. The mix speaks to the broad range, and ages, of interest. The classes can be as hands-on as the participants want. If you just want to watch Mehler's expertise, then you can sit, sip, and watch. If you pay attention, you might pick up a tip or two. "Giving these tips adds to the whole experience," she said. The "experience" is wholly yours. Together, you plan a personalized menu. A trip to Italy coming up? Get in the mood with a "Night in Italy." Mehler does all the shopping and brings the ingredients to your home to cook. One of the best parts? She cleans up afterward so there's no messy kitchen to contend with after your guests leave. She can work in almost any kitchen, but like most chefs, will bring her own (sharp) knives. For corporate events, the food is the centerpiece. But there's a side dish of growth and education. The idea has its foundation in her experience with Mercyhurst's food service management class. There, the students aren't trained to be chefs, but they do spend 15 weeks working in teams to understand all aspects of the restaurant service – from the kitchen to the front of house. "I was looking at these kids learning off of each other," she said. "I saw an opportunity to take people out of the work space, and they have to work in ways they are not used to [in a kitchen]. It changes the way you look at and work with each other." In other words, the boss may be terrific at setting timetables, but is terrible at getting a meal to table. An administrative assistant may not be able to make widgets, but can manage co-workers to prepare a meal in under 30 minutes. "It's a different atmosphere than sitting in an office," she said. In the next year, Mehler plans to dish up some pop-up experiences. She recently launched her website, thecookingschoolerie.com. Contact Meghan Mehler and The Cooking School via email at chefmeghan@thecookingschoolerie.com, at thecookingschoolerie.com and on Facebook at The Cooking School. Marnie Mead can be contacted at mmead@eriereader.com and you can follow her on Twitter @makeiterie.